I am in the middle of writing my dissertation, and I’m constantly experimenting with my writing process flow and set-up. I have two monitors, a 19 and a 22-inch one. The overall writing process appears to be a recursive process of alternating between outlining and writing (though the two are not always clearly separable). My actual writing started once I got to a point that I had so many outlines in different outliners that the only way out of that morass was to start writing them up. Let’s call that condition obsessive-compulsive outlining behaviour (OCOB), and the cure “writing.” The reason for the many outlines is that I use outliners as part of a distillation process, for extracting and abstracting information by translating ideas from one outliner into another. This is a fun and productive process until it gets out of hand and you end up with more outlines than you can keep track of. At that point I decided to start writing, so that the written piece be the place where all the information from the various outlines can be consolidated into a final train of thought. To my surprise I have selected Word 2010 as my main writing tool. I considered Scrivener and DragonPad, but I found that Word trumped them by being compatible with the most software that I wanted to use during the writing process. For one, I could dictate directly into Word and all the Dragon NaturallySpeaking functions would work the same as in DragonPad, making DragonPad redundant. Scrivener on the other hand couldn’t handle direct Dragon dictation. But I also already had a detailed outline in Scrivener (using it as a two-pane outliner), so it seemed sensible to keep that open in my second monitor, while doing the writing in another software in my main monitor. For times when I wouldn’t be using Dragon, I would want to use WordExpander to speed up the typing, and it turned out that it would display the pop-up menu of word choices by the cursor in Word but not in Scrivener. Finally, Word has an EndNote add-in, so I could directly be inserting references as I write, rather than using a more roundabout way of referencing in Scrivener by having to paste in raw EndNote code first, and then having to convert it once the Scrivener draft had been exported into Word. While Scrivener has strengths when it comes to tracking word count and to switching from an individual section view to a total document (Scrivenings) view, word count in Word is acceptable and I can use headings to navigate the document when the Navigation Pane is enabled. So, Word is open in my 19-in monitor that is facing me and where I do the final writing up (dictating with Dragon or typing with WordExpander). I also have a little 4-inch (10 cm) of a NoteTab Light window open on the right of the Word window, where I type quick notes I need to refer to or text fragments I want to use a bit later. In my 22-in monitor that I have on my right-hand side at an angle, I have a number of software windows open, though not all at the same time. At most there would be two open at any one time, arranged vertically.These would include my three main outlines which I have given up on consolidating into a single overall outline. They are in Natara Bonsai (a single-pane outliner), Outline 4D (a single-pane outliner with inline notes), and Scrivener (a two-pane outliner). Scrivener holds my overall outline for the whole PhD, for all 8 chapters. Outline 4D holds a detailed outline just for my current chapter. The advantage of Outline 4D over Scrivener (as an outliner) is that it is single-pane, so I can see the entire text with its headings and sub-headings in a single window. Although Scrivener does have the “Scrivenings” view which combines all its documents into a single view, it is more of a ‘tape’ view than an outline view. Plus in Outline 4D you can select different colours and fonts for the different hierarchical levels, which makes navigating and comprehending the outline easier. Finally, I have an even more detailed outline of just one section of the chapter in Bonsai. Bonsai’s disadvantage over Outline 4D is that it does not have inline notes (notes can be displayed in a separate pane to the right of the outline or at the bottom, which is just not the same). On the other hand Bonsai is faster to operate than Outline 4D, can cram more information into the same amount of window space, and it also allows you to colour in hierarchical levels. Besides the outlines, I also need to have ConnectedText (CT) open, as it contains my reading notes. This information is more detailed than the one in the outlines. If I need even more detail about the particular source (usually an academic article), then I look at the corresponding PDF with the original article in PDF XChange Viewer (it’s called up by one click on the PDF link in CT). Finally, I also have Directory Opus open, should I need to look for a file that way; EndNote, so I can insert references directly into Word as I’m writing; and Waterfox, so I can look up things on the Internet, when necessary. This describes the set-up of my outline-to-writing process. It’s a matter of gathering and weaving the information from the various application windows together into the written text in Word. However, the reason I called this “recursive outlining and writing” is because after I had written a reasonably big junk of text, I need to go back and outline some more. The reason for this is that the actual written text has its implicit outline of its own, which does not fully correspond to any of the original outlines. First, it already started out as an amalgam of the other three outlines, so it naturally can’t be identical with any of them perfectly. However, the work of outlining and conceptual development continues during the writing process itself. The writing itself is the workshop where some of the final ideas get eventually hammered out. The text has some new content. In order to fully grasp the implicit structure of the argument that I have developed in the course of the writing, I need to re-create it in another outline. (It’s difficult to discern this structure easily in the written text itself, once you have thousands of words in a complex academic-type writing). Let’s call this step “retrospective” or “reverse outlining.” The perfect tool for this I found in VUE. I did try Noteliner first, but I found that using a visual concept-map worked better than yet another text-based outline. 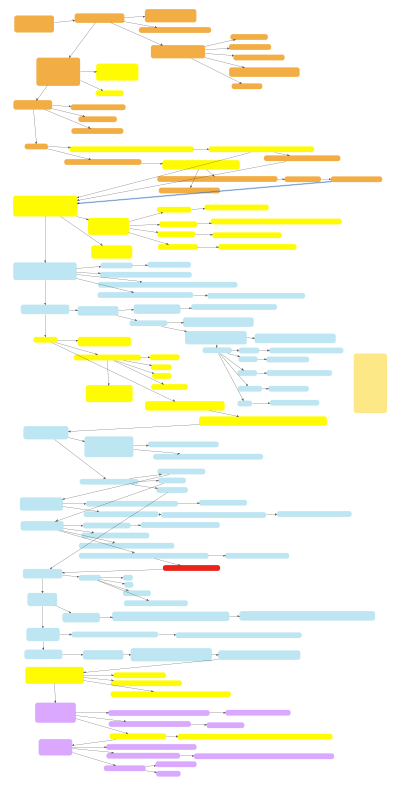 I maximised the VUE window to the entire 22-in monitor, and starting at the top, flowing from left to right, and then downwards, I started to map out the core argument of each paragraph in the form of a concept map. When the screen filled up, I just continued scrolling down (there seems to be unlimited space). I also used colour to mark out important moments such as theses, propositions or key findings. Each major section of the chapter is represented by nodes in different colour. Arrows are used to represent logical relationships. This reverse visual outline helped me find gaps in my argument, as well as redundant sections. It also worked as an analytical tool, as it helped me discover new relationships and come up with new findings and interpretations. It also helps with developing a sense for what to write about next. 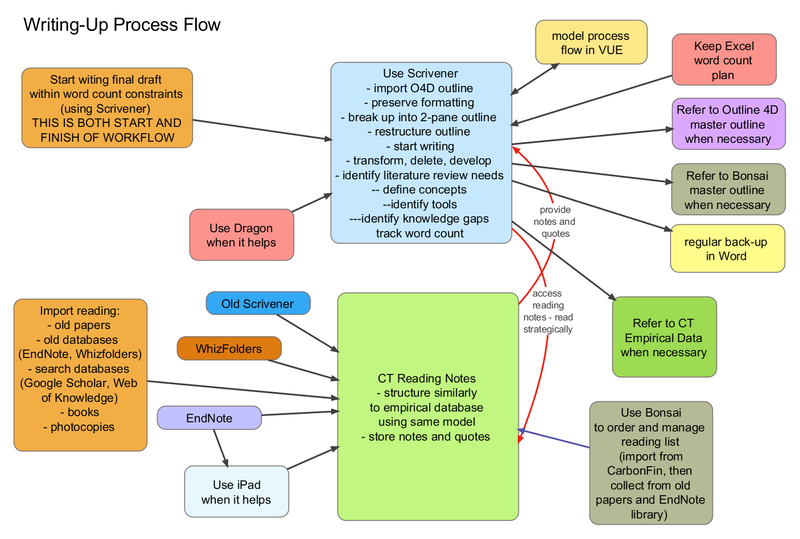 This recursive process of outlining-writing-outlining (with the help of VUE as the virtual whiteboard where I sort all my conceptual issues out) is likely to become a permanent part of my writing practice. I am even considering printing these VUE maps out and pinning them on the wall. This would enable me to survey the entire line of argument from chapter 1 to chapter 8 of my dissertation, that represents a text potentially the size of 80,000-100,000 words.